The year is quickly drawing to a close, and with Christmas and New Year’s falling on a Wednesday, many dealers are taking some time off to spend these last two weeks with their families. But there are still some others working hard to finish the year strong and most are trading in precious metals. Though the market has softened, many buyers have taken the opportunity to add to their holdings at these lower levels. 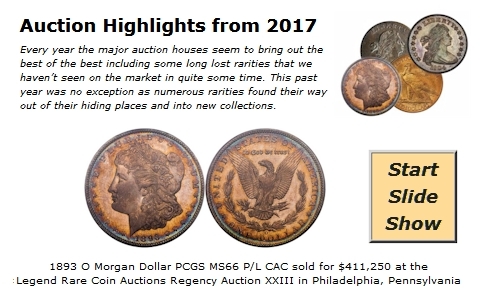 As for rare coins, most dealers are preparing for the upcoming FUN Show; however, when better coins are offered on the teletypes at reasonable levels, most are quickly sold. Many dealers expect this trend to continue well into next year. 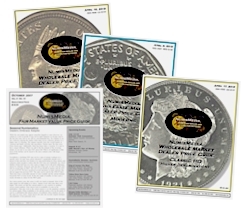 Over the last few weeks transaction updates have created a whole new list of advances for the NumisMedia 500. 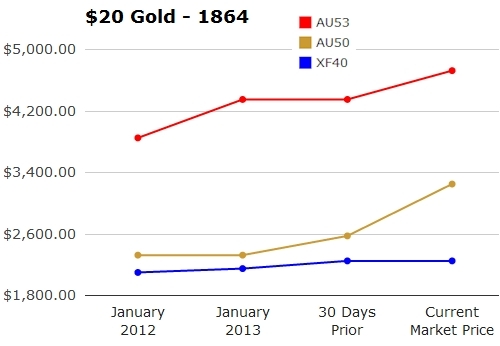 The 1864 $20 Gold Liberty in AU50 is the highest percentage gainer in the last 30 days with a 26.2% increase. The Market price advanced to $3,250 from the previous $2,575. Also making a dramatic move is the 1906 O $10 Gold Liberty in MS64, now at $5,125, up 17.8%. Below you will find a few more highlights from the last month. A large amount of the increases have been in the U.S. Gold charts. Any of the better dates are in strong demand and seem to have very competitive bids when they appear in major auctions. Thirty-seven of the Top 100 advances in the last month are Gold; this despite bullion edging below the $1,200 mark. 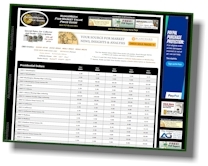 In this week’s HD Wholesale Market Dealer Price Guide the majority of charts are showing upward adjustments indicating a very stable market. The exceptions are in the U.S. Gold charts where lower bullion has caused the generic prices to retreat. Morgan and Peace Dollars have a lot of increases in MS63 to MS65. Buyers are very aggressive and some dates are quickly drying up in the marketplace. This is our last report for 2013. We would like to extend to all of you a very Happy Holiday and a successful New Year in 2014.